I have also reported for a daily newspaper in Mumbai - The Hindu Business Line - where I learned the roped of business/financial reporting as an intern. When it comes to print, I enjoy writing no matter the format. From profiles, fact boxes, 300-word stories to 5,000-word features, I enjoy them all. Please click on the links below to view print stories in a new tab. In 2011, Aquatic Conservation published a peer reviewed paper on the effects of humans on the Gharial's habitat. I was part of two expeditions that involved walking 100+ kilometers along the bank of the Chambal river in Rajasthan, India, to collect and note data on Gharials and their habitat. Indonesian rainforests under threat from palm tree cultivation. "A scathing report put together by Greenpeace India on the Indonesian palm oil industry could hold important lessons for Indian policy makers on commercial exploitation of forest land." The majority of my work has been writing for the World Wide Web. With over five years of blogging experience using hosts like Blogger and WordPress, I have an extensive track record when it comes to producing online content. In 2011, I developed this blog for an International Reporting class I took while studying journalism. As an Indian citizen fairly new to Montana at that time, I chose to report on local Montana stories with a focus on environmental/animal-related stories in keeping with my Master's major - environmental journalism. I also have solid experience in using social media platforms like Twitter, Facebook, LinkedIn, Instagram, Whatsapp, Google+ and recently, Storify, for reporting stories live. One such story was of The Carlyle Group attempting to buy Missoula Water. That story is available here. As the only student member to attend the Society of Environmental Journalists annual conference in Miami in October 2011, I was able to network with the finest environment and science reporters, editors and journalists in America. A limited person 5-members-only tour was on the cards for those who wanted to tag along during a live wildlife shipment inspection with Miami Fish and Wildlife Service. I was fortunate enough to be one of those five journalists who got an exclusive tour, witnessed the inspection, asked endless questions and made worthy contacts. This is what I wrote about my experience on the tour for SEJ's unofficial conference blog. It’s well known that climate change is significantly affecting the world’s oceans as sea level rise and water acidifies. But forests are also experiencing big impacts. Shifting precipitation patterns are bringing droughts to the Amazon rainforest, and warmer winter temperatures are allowing tree-killing beetles to spread farther north in boreal regions. Now, new research finds that climate change may be making tropical forests “move.” -- READ MORE HERE. For decades, Payeng struggled alone. “It was painful, but I did it,” he said. “There was nobody to help me. Nobody was interested.” Payeng’s remarkable achievement only came to light in 2008 when the state’s forest officials chanced upon a dense forest – the Molai forest – that they didn’t know existed. READ MORE HERE. In the northeastern Indian state of Assam, a 51-year-old man lives with his family in a small hut without electricity or a water connection, isolated from the hubbub of nearby cities. Jadav “Molai” Payeng, a member of Assam’s indigenous Mising tribe, resides in Assam’s Jorhat district in the village of Aruna Chapori. Here, for the past 35 years, he has worked to plant trees on a sandbar island in the river near his home—and in the process, single-handedly established a forest larger than New York City’s Central Park now home to tigers, rhinos, and elephants. Ecological restoration is a widely recognized way of reversing some of the damage done to converted land. Now, a new study finds it may help save one of the most imperiled ecosystems on the planet - while still allowing room for agriculture. -- READ MORE HERE. A landmark achievement was celebrated in southwest Colombia in May when the Colombian Institute for Rural Development approved the expansion of the Inga people’s Yunguillo Indigenous Reserve. The expansion was first requested in 1983, but after 20 years of legal, administrative and infrastructural struggles, the efforts of those involved – including conservationists, human rights activists and indigenous communities – finally paid off as the reserve was quintupled from its original 4,320 hectares to 22,395 hectares. -- READ MORE HERE. On May 8, when 56-year-old forest guard Rampal Saini set out to patrol an area of India’s famous Ranthambore Tiger Reserve, no one had any idea it would be his last day alive. Saini was attacked and killed by a tiger with a bite to the neck. -- READ MORE HERE. In a press conference held in May 2015 in the Sri Lankan capital of Colombo, U.S.-based nonprofit Seacology, Sri Lanka-based NGO Sudeesa (formerly known as the Small Fisheries Federation of Sri Lanka) and the government of Sri Lanka announced a joint program that makes Sri Lanka the first country in the world to grant full protection to all its mangrove forests. -- READ MORE HERE. In December 2014, 350,000 litres of oil spilled into the Sunderbans delta – the world’s largest contiguous tidal mangrove forest and a World Heritage Site – of which one-third lies in India and two-thirds in Bangladesh. The spill, from the collision between an oil tanker and a cargo vessel, occurred in a protected sanctuary for the endangered Irrawaddy dolphin (Orcaella brevirostris) and the Ganges river dolphin (Platanista gangetica). The Sunderban mangroves, like many others, are home to an plethora of endemic and protected species including Bengal tigers (Panthera tigris), black-capped kingfishers (Halcyon pileata), endangered fishing cats (Prionailurus viverrinus), salt-water crocodiles (Crocodylus porosus), water monitors (Varanus salvator), and green sea turtles (Chelonia mydas). -- READ MORE HERE. "For 10 million years the Indonesian island of Sulawesi has been disconnected from other landforms, almost inviting evolution to color outside the lines. Despite a growing population and limited space -- more than 17 million people reside on the island as of 2010 -- Sulawesi has managed to provide a safe haven to hundreds of unique species as they evolved over millennia." In the forests of Tasmania lives the swift parrot (Lathamus discolour), a highly threatened bird that breeds nowhere else in the world. New research published recently in Biological Conservation finds they are more at risk of extinction than previously thought, with introduced sugar gliders (Petaurus breviceps) and logging dealing two big blows to their remaining numbers. -- READ MORE HERE. Zimbabwe, home to more than 14 million people, is currently facing a severe economic crisis. Under President Robert Mugabe’s land distribution reforms, in the year 2000 all white-owned commercial farms were forcibly seized for redistribution to landless native Zimbabweans. In February this year, the BBC reported Mugabe had finally admitted his land reforms amounted to badly thought-out land policies. These reforms are thought to be the driving force behind Zimbabwe’s agriculture-based economy’s thunderous collapse. READ MORE HERE. The study showed many of Peru’s species are inadequately safeguarded, with threatened species less protected than non-threatened species. All of Peru’s species listed as Critically Endangered by the IUCN, 86 percent of its Endangered species and 62 percent of its Vulnerable species failed to achieve their conservation goals. READ MORE HERE. Many of the world’s protected areas may not be located in the areas that need them the most, according to a recently published study in the journal PLoS ONE. The study examined the effectiveness of Peru’s existing protected area system in holistically preserving the biodiversity in this megadiverse country, finding it inadequately protecting many of the country’s species. READ MORE HERE. China’s Heilongjiang province, which borders Russia to its north and east, contains 18.5 million hectares of state forest – more natural forest than any other province in the country. However, since the mid-twentieth century, Heilongjiang has had over 600 million cubic meters of timber extracted from its woodlands. Now, China is trying out a complete ban on commercial logging in the province’s state-owned forests. READ MORE HERE. Saving the world's rarest primate: can it be done? Critically endangered and endemic to China’s southernmost province of Hainan, only around 30 Hainan gibbons (Nomascus hainanus) survive today. Rapid island-wide deforestation and consequential loss of habitat, uncontrolled hunting, and failed captive breeding attempts have pushed this ape towards the precipice of becoming the first primate species to go extinct in the modern world. A study on the impact of forest loss on biodiversity, recently published in the journal Conservation Biology, shows that one-third of the Brazilian Amazon is headed toward or has just passed a threshold of forest cover beyond which species loss accelerates and is more damaging. "The great apes are among some of the most endangered species on Earth, the targets of poachers and the victims of deforestation. However, from time-to-time there comes news of hope. A study published recently in Oryx describes the dire situation faced by Bornean orangutans, as well as an ambitious project to help save them." The island of Hainan in the South China Sea is the largest of about 200 islands constituting the south-eastern Chinese province of the same name. On this island, a Critically Endangered primate struggles to survive in what’s left of its home. "Two decades ago, a project to convert one million hectares of forest to rice paddies was undertaken by the Indonesian government in southern Kalimantan. As predicted by experts, this Mega Rice Project (MRP) was a massive failure and was eventually abandoned, but not before it destroyed critical orangutan habitat. Now a new project is trying to knit together what's left and turn the area's isolated orangutan populations into one of Borneo's largest." Across the world, scientists estimate there are about two billion hectares of degraded forestland. In Indonesia alone, 25 million hectares of former logging concessions currently have no management, according to research. A study recently published in mongabay.com’s open access journal Tropical Conservation Science suggests this may represent an important opportunity for biodiversity conservation through restoration. "BOZEMAN - After days of deliberation and debate about whether they would show up to begin with, members of the Westboro Baptist Church were seen protesting on the Montana State University campus, as per their announcement." "We're trying to get a universal symbol for venomous and poisonous species. It will really help because now we just use the cross-bone and skull sign but we really are fighting to get that symbol so that everyone who might ever come in contact with those boxes will know that they should stay away," said Pages." On Tuesday, the Montana Supreme Court rejected an appeal by Park County challenging an expansion of the area that bison can roam north of Yellowstone National Park. Park County appealed after a district judge ruled that is was permissible for bison to occupy areas in the Gardiner basin during winter months. For non-Montana residents, understanding the big debate over wolves and whether they are bad or good, can be overwhelming. Here’s a bird’s eye view of the issue. A wolf management specialist with Montana Fish, Wildlife and Parks, Kent Laudon has worked with wolves since 1997. He says that the long-standing, currently hot conflict between wolves and people might actually stem from something a lot deeper. "A ruling against the Carlyle Group's effort to purchase Missoula's water supply will send the debate straight to court, John Alke, attorney for Mountain Water Co., warned the Montana Public Service Commission at the start of a two-day hearing to consider the sale of the company." On a relatively chilly winter afternoon in rural central India, I was attempting to lay flat on a bunch of jagged rocks without moving. As the rock edges slowly cut through my skin, I made sure my hands stayed steady and no dust settled on the camera lens. The efforts paid off when one of the world's most endangered crocodiles emerged quietly from the river and began climbing up the sand bank - a stone's throw from where I was. As mesmerized as I was witnessing a amazing natural phenomenon, I had no idea I was setting a record. That afternoon, the pictures I took were the first pictures of a courtship ritual between a breeding pair of Gharials to have been taken at this particular breeding site. They proved that the site was indeed an active breeding site for the critically endangered reptile endemic to the Indian subcontinent. These pictures were published by ARKive.com. In August 2013, I was requested to allow the use of these images for a competition being organized partly by the British Science Association. My pictures have additionally been picked up by online journals, blogs and have found their way into several of my academic reports detailing field expeditions, etc. TO VIEW MORE IMAGES, click on Galleries. An adult male Gharial basks on a pristine sand bank in rural central India waiting for a female Gharial to emerge from the river - part of a courtship ritual in breeding season. An adult female Gharial on a sand bank in rural central India. A Gharial's snout has evolved to be thin, long and lined with sharp inter-locking teeth - making it an expert at trapping and eating fish. Miami Fish and Wildlife Service officials inspect a shipment of live wild flora and fauna to look for any irregularities or illegal shipments. Illegal wildlife trade is the fourth most profitable trade in the world said to be worth almost $20 billion annually. Tracking a tigress in Bandhavgarh Tiger Reserve in central India. 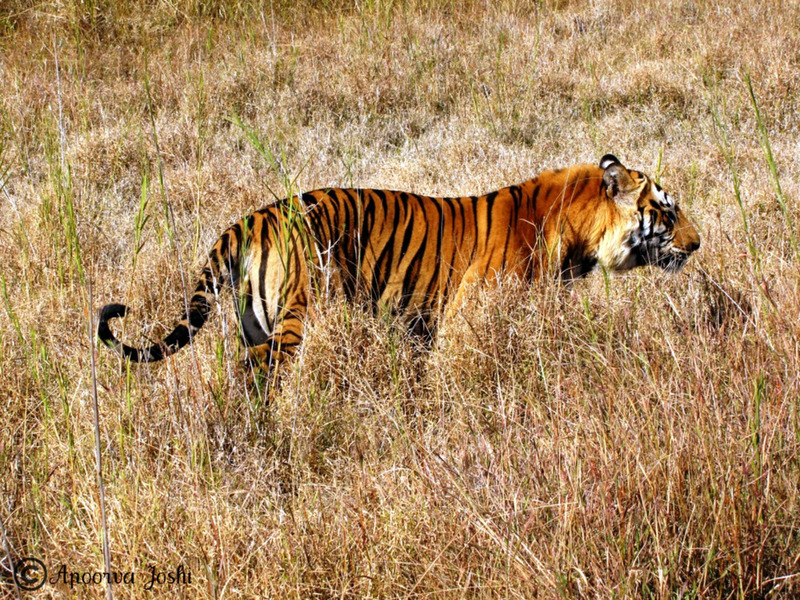 The Bamera male - an adult male tiger in Bandhavgarh Tiger Reserve who now rules his own territory. 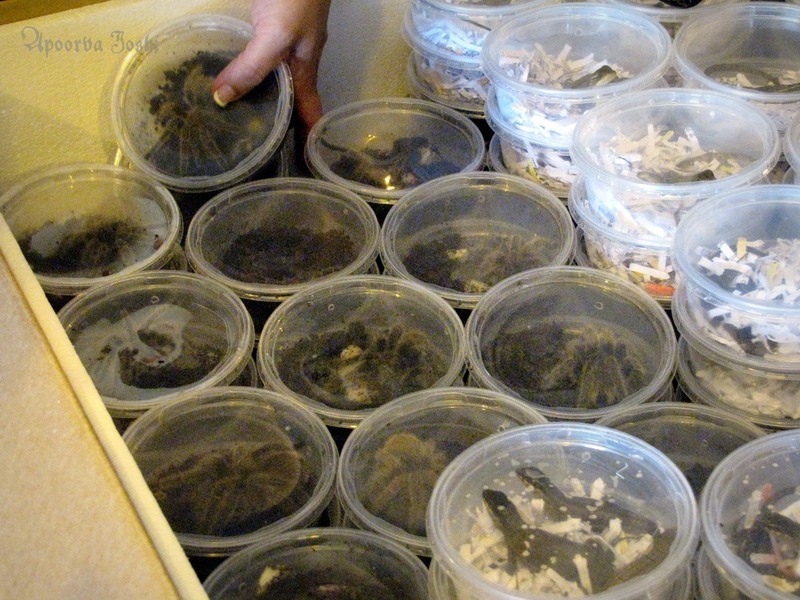 Tarantulas in box full of live animals being shipped to Miami from Europe for the pet trade. Frogs, lizards, geckos, spiders, snakes, fish, octopuses, insects, birds - are common contents of these wildlife shipments. FWS must conduct thorough inspections to make sure no illegal shipments find their way into the wildlife trade. Wild orchids - endemic to India's diverse Western Ghats. A frog nest! Rhacophorus malabaricus, a endemic species of gliding frogs, made this nest on a tree branch hanging over a pond. 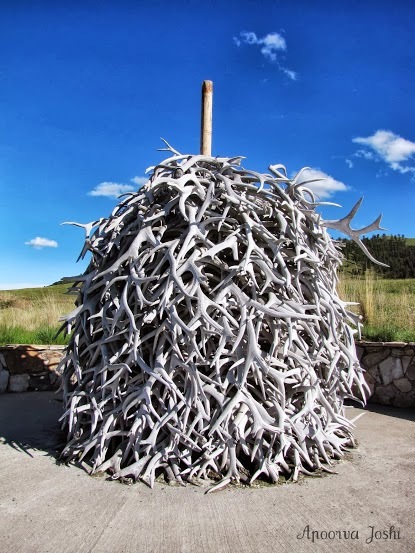 A pile of shed antlers at the National Bison Range in Montana. After graduating from the School of Journalism in May 2013, I spent most of my day combing through job announcements, shortlisting appropriate postings and then applying to jobs. While living expenses piled on in the form of utilities and rent and phone bills, I decided I needed a worthy distraction that I can learn from. The KBGA College Radio station on the University of Montana's campus was looking for news readers who could also write scripts for their daily 5 p.m. broadcast. Upon inquiring, I found out it was a volunteer position. Pros: Great opportunity to step outside my comfort zone and try my hand at radio journalism, inbuilt chance to learn how to use some audio equipment and how to speak on air, networking, welcome change to a rather dull phase. Obviously, I took it. I figured I could always stop eating or using my phone to cut down on expenses and this was something I really wanted to do. So for about three to four weeks, I learned the art of writing for radio and speaking on air. To listen to the audio clip, click on the files below.